Are you interested in bees and thinking you might like to take up beekeeping? Wondering what Reigate Beekeepers is doing to save the bees? Trying to decide which beekeeping club to join? Well why not start with a look at what Reigate Beekeepers are doing…. we are always looking for new members, from complete beginners to advanced beekeepers, and also those wishing to return to the hobby. Our primary teaching apiary is just south of Dorking. We offer both hands on and class room based training and also some guidance and assistance if you are thinking of setting up your own apiary. We offer advice on selecting the best position for your hives, (often by a visit from an experienced beekeeper) or, assistance in finding out-apiaries, even microscopy of bees for annual health checks. Reigate Beekeepers must be amongst the busiest of associations in Surrey. It is a very pro-active club, with activities ranging from social events, winter lectures, to practical training. Here’s a summary of the club recently. At 200+ members, we are the amongst the largest clubs in Surrey. Our membership ranges from the young, and those who are only beginners in beekeeping to those who are very experienced. Over a 100 events have been organised by Reigate Beekeepers members. These range from school visits and talks with an observation hive to a two day bee hives health tour by our Regional Bee Inspector. During the year we attend at least 23 shows ranging from small village fêtes to a two day major events at Polesden Lacey with around 5,000 visitors. Members give talks about beekeeping to many groups, including over 12 talks to W.I. groups prior to their decision to debate ways of supporting honey bees at their AGM in the Albert Hall. There have been seven media events at our training apiary from ITV news to local radio. Our summer weekly practical evenings (April-August) at our training apiary regularly have more than 60 members present. 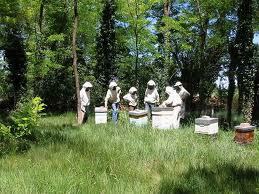 During the winter (September-March) we hold monthly beekeeeping lectures. Our members achieve significant success in the British Beekeepers Association examinations. Our honey extraction day is run as a teaching event with typically 20 people learning the ropes and extracting 190 pounds of honey at the same time. We sell club honey and other bee products at the Reigate Farmers Market. We run two bee health clinics each year typically testing over 100 colonies and training prospective microscopists at the same time. In service to the community our swarm team typically receives 190 calls, attends around a 120 incidents and collects over 80 swarms. More information about Beginners Training Courses and Taster Day sessions can be found under the Learning Centre menu tab. Click here to enquire directly about course details and course enrolment etc. 1917 Founded by Miss M. Whyte-Johnstone – an expert beekeeper and quite a character by all accounts! 1942 Membership had risen to 242. Many people took up beekeeping during the war to take advantage of the increased sugar ration. 2010 Divisional training moved to the new apiary. 2013. Planning permission granted to build a teaching facility & fund raising initiated for the project under the banner of “Education Space” project. Unfortunately, posting this type of question as a ‘Comment’ will not achieve the speedy response you may have hoped for. Instead, if you have not done so already, please try to contact one of our listed Swarm Collectors, nearest to where you live. When you talk to that person, please attempt to describe what you are seeing and what kind of bees you believe the swarm to be. Please also be sure to pre-read the different posts on this website about swarms of honey bees and nests of bumble bees. We may be unable to help with the latter. I keep finding bees dead in flower heads, sometimes they’re not yet dead but appear unable to move, I don’t use pesticides in my garden. Is there anything I should/not be doing? I have bees flying in and out of my roof space. Help! What do I do? Obviously don’t want to harm them in any way. Kim, are you certain they are bees ? Wasps often build their nests in roof spaces. The wasps nest looks like it is made of a light coloured paper-mache and is an enclosed roundish structure. Whereas bees do not build nests, they only construct honey comb which would be visible. If they are not causing a nuisance they can be left undisturbed.